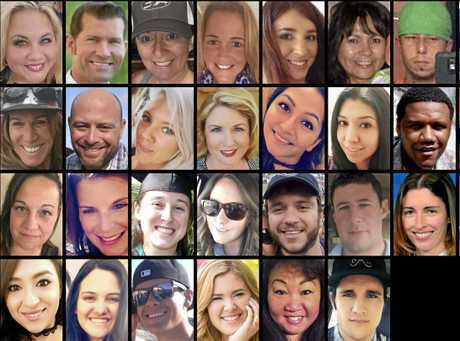 THE police officers who first stormed the hotel room where Las Vegas gunman Stephen Paddock carried out America's biggest massacre in history have broken their silence. 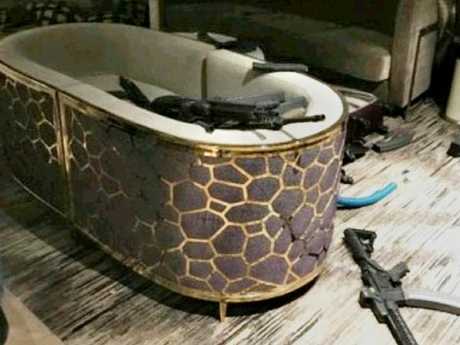 The officers being interviewed were the first to see Paddock's body and his massive arsenal of weapons and ammunition he had stockpiled for days before his mass shooting. Officer Dave Newton from the Las Vegas Police Department's K-9 unit said he noticed a note on the shooter's nightstand. "I could see on it he had written the distance, the elevation he was on, the drop of what his bullet was gonna be for the crowd," Newton said. "So he had that written down and figured out so he would know where to shoot to hit his targets from there." 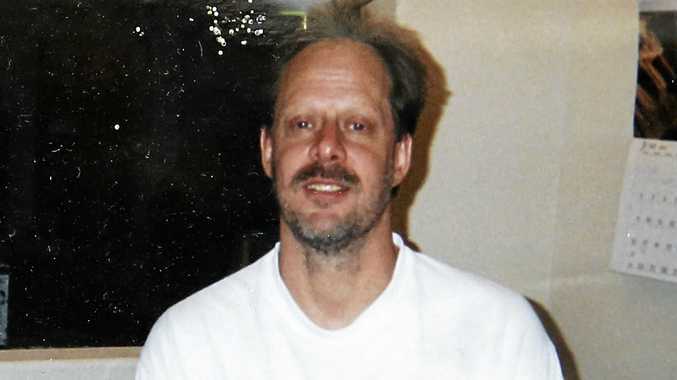 Paddock's hotel suite was on the 32nd floor of the hotel. "Very eerie. Yeah, the dust from the explosive breach. And then you have the flashing lights," Newton said. "And that looked straight, like, out of a movie, you know?" 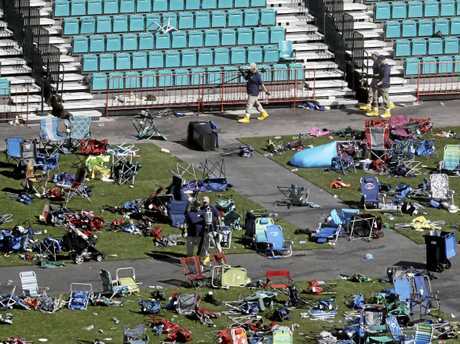 Paddock's hotel suite gave him an ideal perch from which to carry out his attack on a crowd of more than 20,000 people attending the festival concert across the street, some 365 metres away. The note has not shed any light on the gunman's motives, which authorities are yet to uncover nearly a week after the deadliest mass shooting in recent US history. The anonymous official confirmed the gunman had travelled on a dozen voyages over the past few years - one of which was to the region. Rukmini Callimachi, a reporter with The New York Times who covers the fanatics for the influential newspaper, said IS's claim carried weight. She said: "ISIS has rarely claimed attacks that were not by either their members or sympathisers. "I don't buy the argument that they are now opportunistically claiming attacks to deflect from battlefield losses." Police in Las Vegas said yesterday they have looked at "everything" in Stephen Paddock's life and can find no motive for what drove him to commit America's deadliest mass shooting. Saying they could find "no known nexus" to suggest Paddock was acting on behalf of Islamic State, Las Vegas police confirmed he was alone in room 32135 of the Mandalay Bay casino when he opened fire last Sunday night. 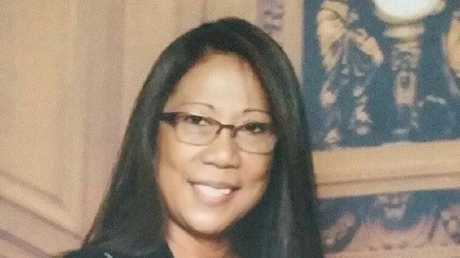 A lawyer for Paddock's Australian partner, Marilou Danley said she "continues to co-operate fully with the investigation". "She does not anticipate making any public statements today or in the immediate future," he said. Clark County Undersheriff Kevin McMahill yesterday expressed the frustration of police and FBI officers who have "run down well more than 1000 leads in this investigation". "Some of it has helped create a better profile into the madness of this suspect but we do not still have a clear motive or reason why," said Sheriff McMahill. "In the past, terror attacks or mass murder cases, motive was made very clear by a note that was left by a social media post, by a telephone call that was made. "Today, in our investigation, we don't have any of that uncovered. I wish we did." "We do not clearly have a motive or a reason why," he said. "I can assure we are aware of all aspects of this case to include the rumour, innuendo and suppositions by many in the public. "And I get it. We all want answers." While police said they were now confident Paddock was alone on Sunday night, they believe someone may have had knowledge of his plans. 'We're very confident there was not another shooter in that room," he said. 'What we cannot confirm is whether anybody else knew about this incident before he carried it out." Sheriff McMahill also offered more detail about the hotel security guard who is credited with saving countless lives after he approached Paddock's room and distracted him. "Jesus Campos is a true hero," he said. "He was dispatched to what they call a door alarm on the 32nd floor." "He went up there to investigate and as he was doing his job diligently, he came under fire from our suspect. "He was struck in the leg, and he turned around, retreated. He notified his dispatch, which was absolutely critical to us knowing the location, as well as advising the responding officers as they arrived on that 32nd floor. 'This was a remarkable effort by a brave and remarkable man. I don't think we've done a good enough job of recognising him and his actions. For that I apologise. "I want to clear the record. 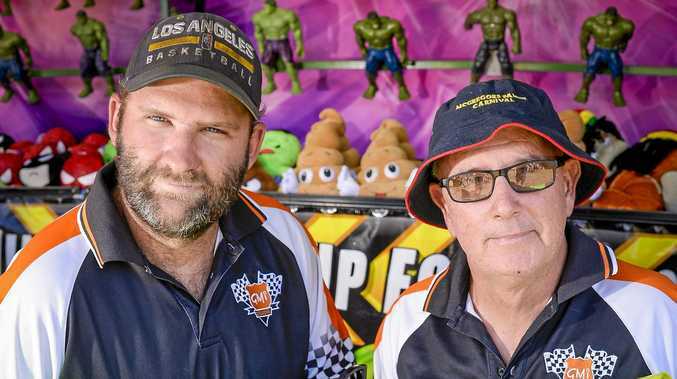 He is an absolute hero," Sheriff McMahill said.